By chance, I found out that Metro Meals on Wheels were asking for donations of handmade (knit, crochet, or sew) potholders. They would be used by drivers or given to clients. They are looking to collect 800 by this coming holiday season (deadline Dec 5), but have an ongoing goal of 8,000. Look for the "Feature: Knit and Sew Potholders" pdf file listed under the Volunteer section on the website for more information. 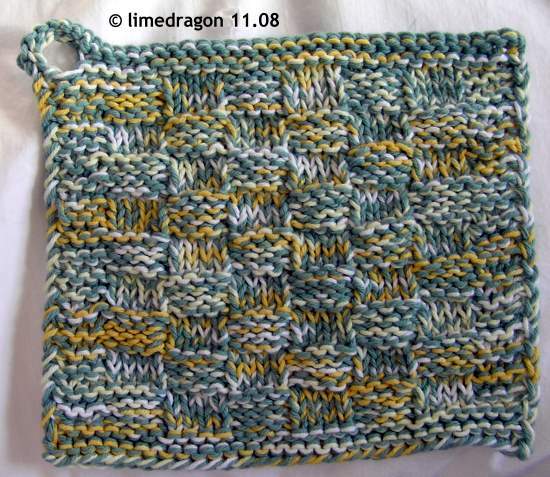 After browsing Ravelry, it seemed like many potholders were cotton, acrylic, or felted wool. I know from experience that I didn’t want to use acrylic. (Acrylic would be fine for decorative purposes but not for actual use, since it melts.) It’s been a while since I knit with cotton, so I scrounged my dishcloth cotton stash for some possibilities. My first attempt was based on a free Drops pattern (link below) that uses double strands. Bad idea. Working two strands together at a gauge usually worked with only one strand was tiring. 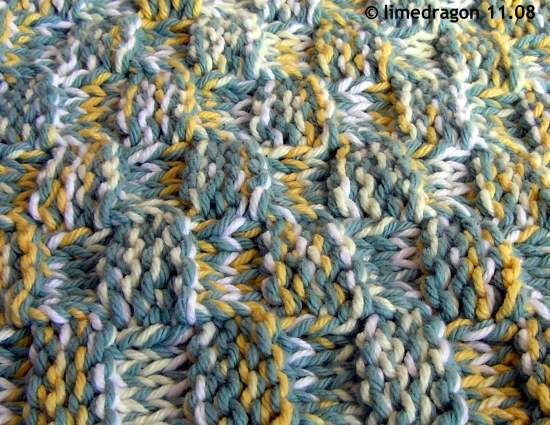 But I was very pleased with the cheerful combination of the yellow variegated with the light teal cotton. Just like the sun and clouds in the sky! Unfortunately, even after several attempts, this effect just doesn’t come through in photos. And the hanging loop is my favorite part; it’s basically a large buttonhole. As I was finishing up, I read the official release and discovered that they prefer potholders within 6" to 7" in size. Whoops! The one I had just finished was huge, about 10". Oh well, I gave it to Mom. Besides, I didn’t have enough yarn to make a set of two, which would be ideal. 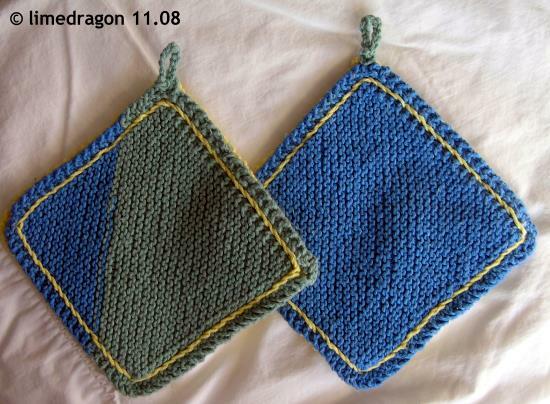 Back to Ravelry I went, to browse potholder patterns. I finally came across Trek’s diamond potholder (link below) and knew it was what I wanted to do. I ran out of the delft blue and switched to the last of the light teal for the second half. In retrospect, I should’ve done the second back in teal and then used the leftovers of each color for the assembly. Still, they’re cute with a touch of kitsch, and this was an enjoyable and quick distraction. I might try to get another set completed before the deadline, or if not, early next year. I used some potholders crocheted from acrylic for several years and had no major melting problems. Now I would eschew the ack for The Real Thing From Sheep, of course. That trek. She gets around. :) I like the simplicity of those! This is a great idea! I’ll have to see if our local Meals on Wheels is asking for these. i love the colors! how sweet of you to donate your time and energy. 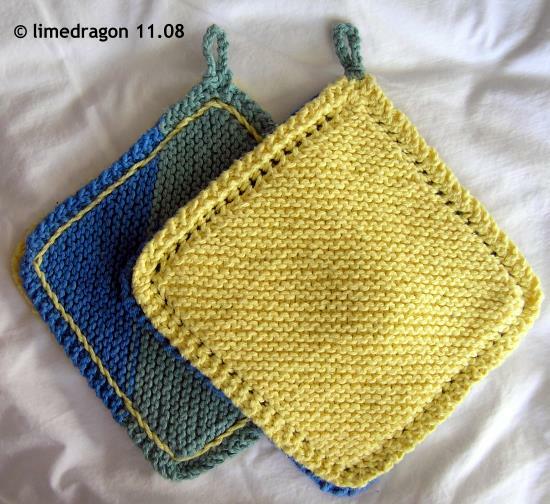 Those are great potholders, what a good cause to knit for. I will have to check out the website for next year. I am swamped right now.